Experience is the #1 reason to choose L&C Enterprises-USA. We have been providing fence equipment and products for more than 25 years based on our experience in the field installing fence. 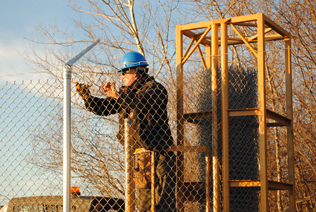 Every product has been tested by fence crews and proven to work efficiently. What we have learned about installing fence is something we are willing to pass along to you. We put our experience into the products we produce. The industry changed dramatically when we invented the Installink fence dispenser. We made chain link more secure with the design of Twist Tight Fence Ties. We saved time and made installation of three strands of barbed wire safer with the development of the Barbed Wire Dispenser. Our experience also determines what fencing equipment and products we recommend. We offer products we know will benefit your company such as the Rhino Post Drivers and Lobo Post Puller. We want you to succeed. We don’t just try to sell you something. We are willing to work with you to determine the best way for you to get the job done fast. We know our products. Our staff has fencing experience that we can share with you. We know the products that we offer and can make suggestions to help you succeed. We’re focused on customer satisfaction. We know that when you are up against a deadline it’s important for us to respond quickly. Our goal is to provide you with the best techniques. Your trust, and our dedication to improving the fence industry, is what inspires us to provide exceptional service. Our account representatives work closely with companies to understand how the proper equipment and fence ties can speed the installation process which means more profitability. Whether you are looking at using pre-formed fence ties on a commercial chain link fence project or equipment to dispense fabric at industrial sites or ways to pull a large number of posts with a cement foundation you will find the products offered at L&C Enterprises-USA work. We believe that the products we offer take the strain off of your fence crews, satisfy your customers with professionally installed fence and make it easier to compete in a market with shrinking profit margins. We know this because our products work for us. Click here to view our product line, then give us a call. We’re ready to help.